Today, I am a painter. 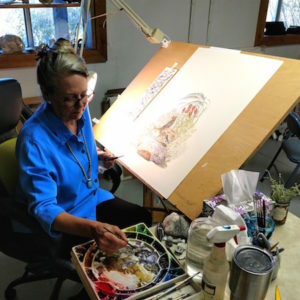 I have accrued over 45 years of professional experience in illustration, illumination, calligraphy, teaching, and painting. Now, my intensely focused watercolors assimilate that rich foundation upon which a challenging and rewarding artistic life continues to be built. My unending passion for words, music, and nature intuitively influence my work. In 2015, I retired as Art Director for a small arts-based nonprofit that supports high needs youth, ages 14-22. In retirement, I have had the great fortune to divide my time and energies between studios in Lawrence, Kansas and Creede, Colorado. My paintings often speak to myth and mystery. I am attracted by the beauty and elegance of the ordinary, the wild, the ruined and cast off. I practice Automatic Drawing -a Surrealist technique immersed in a stream of consciousness. I also practice meditation and acceptance. At 68, my love of adventure, the human spirit, and the quest for noble purpose beats with a steady strength that fuels my continuing evolution as an artist and human.